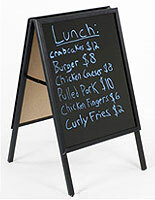 This Professional Sign Supply for Exterior Advertising Features a Write On White Board on Each Side! 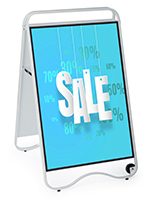 This Sign Supply Offers a Unique Way to Attract More Customers and Boost Sales! Visit the Online Warehouse for the Best Sign Making Equipment Available! 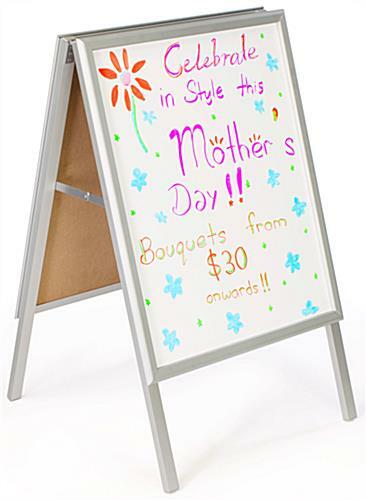 Wet erase white board to easily change messages. 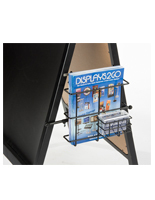 Dual-sided folding marker board can be stored in small area. 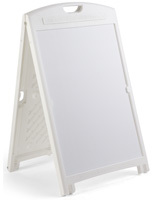 Marker Board includes clear lenses to help protect writing & graphics from damage. Each side of frame can hold a 22" x 28" graphic. This sign supply, also known as a sidewalk sign or A-frame sign, is crafted from aluminum, which makes it durable enough for exterior use. 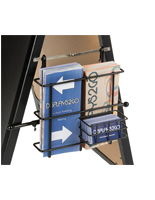 An advertising display, sign supply has hinges that enable the user to fold the display for easy transport or storage in a smaller area. You can use wet erase markers on the white gloss writing surface. 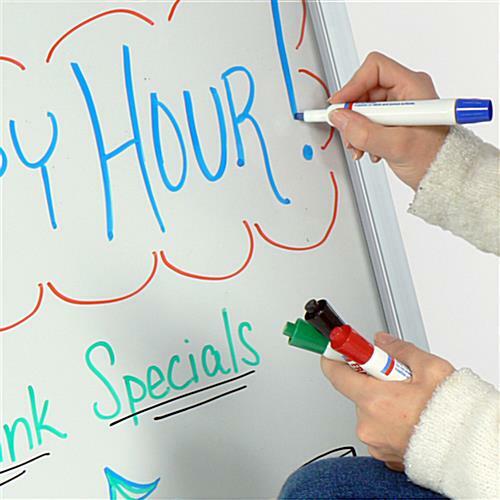 Wet erase markers provide vivid imagery, yet you can effortlessly wipe off the board with a damp cloth. 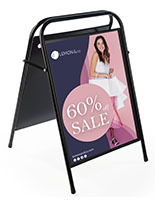 This sign supply is perfect for a street side bar or retail store to advertise upcoming events and specials. 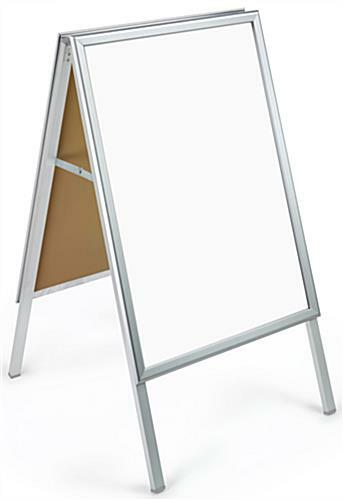 The sign supply features a protective clear lens on each side of the board. 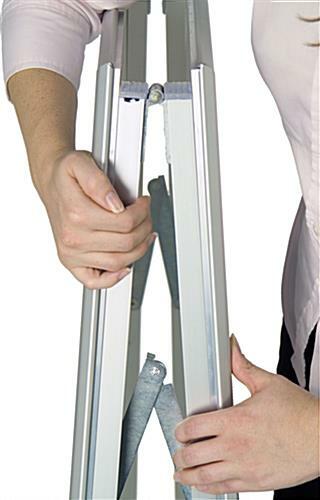 This lens helps protect posters or screen printing placed inside the frame, as well as messages written on the white board. The A-frame sign, sign supply fits a 22" x 28" graphic on each side. Your graphic is held in place with a snap frame. 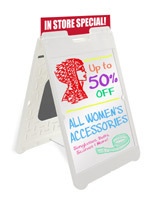 This sign supply uses snap frames, so making graphic changes is quick and easy. Simply snap open the boarder, insert the graphic or write on board, then replace lens and snap it shut. 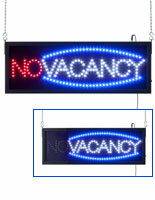 This sign supply is dual-sided to advertise in multiple directions simultaneously. Order the equipment you need from the leading sign making company. Please Note: Although this aluminum sign supply is predominately used for outdoor sidewalk advertising and the aluminum is ideal for rust prevention, there are some limitations! The gloss white writing surface has a wood-based substrate. It can withstand many rain showers, but if sign is left permanently exposed to rain and wetness over time (not brought inside during extreme conditions), some bowing, warping and delaminating may occur. Customers have had good luck with life expectancy of this item. Just try to bring indoors during days of extreme rain. 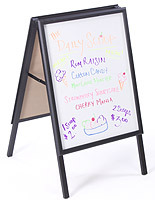 This board can only be used with neon/fluorescent wet erase marker and is not designed for dry erase markers. Writings are easily erased with damp or moist cloth. 18.0" x 39.5" x 25.0"